My specialties are running form & technique, swimming form & technique, and mtn bike skills. In each I can build speed and power. $150 for a 3 month tailored training plan email access.$100 per month for month b month tailored plan adjusted to your varying shedule along with email access and monthly calls.$200 a month for week by week tailored workouts, unlimited email and weekly phone calls.$50 per hour for one on one coaching. I have been competitive in triathlons for the past 8 years--even two of which I was pregnant for! 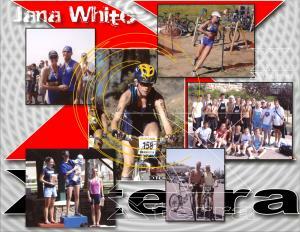 In 2004 (before kids) I was the Xterra Mtn Region champion and competed in Nationals. I have been the head High School XC Coach for 14 years, and was the head swimming coach for 1 year (not a fan of 4 am practices!). I am a certified USAT level 1 tirathlon coach as well. I love the sport and love to see new people get involved, and experienced people reach their goals. I am willing to push you to achieve whatever goal you have. I do have the ability and experience to do so. Success. Coach Jana White has been notified of your message.